Professional? I don’t think so. You know how behavioral psychologists claim that females mature sooner than males in almost any area you can name? This blog post is about the exception to that rule – the one area where males usually pay attention and figure it out before females. Well before females. By the time most males reach their late twenties and certainly by their late thirties, they’ve decided they don’t have to allow fashion fads to trump professionalism and comfort. 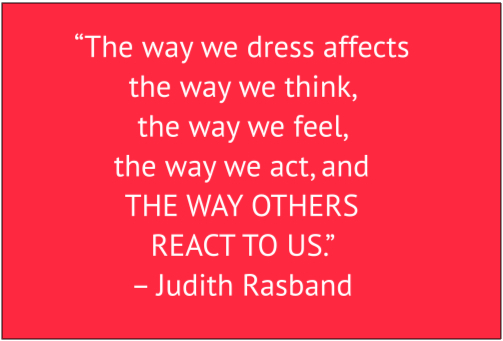 Twenty-something and thirty-something females, on the other hand, are usually still allowing what’s in style and the latest fashion fads to dictate their wardrobe choices, regardless of whether those styles are flattering, appropriate, or comfortable. I was right there with them in my 20s and 30s – until I caught sight of myself fighting with my clothes whilst trying to run a meeting with a CEO client and his assistant. How did I look, you ask? Like one of those self-absorbed teen girls you’ve seen – pulling up a neckline, yanking down a hemline, fluffy up a staticky skirt, scrunching up too-long sleeves. I was very busy indeed – just not busy paying attention to my client and the project for which I’d been hired. That’s when I made a new rule for myself: Remove “fight with clothing” from my daily to-do list. It’s long enough anyway without adding something so pointless. When you find yourself fighting with a garment, ban it to the back of the closet that night. When you buy new clothes, find a dressing room with plenty of mirrors and a seat, and put yourself through the paces of a normal workday. You know all those fetching models who wear these fashion fads we’re discussing (like the dolman-sleeved, halter-topped vixen above)? Remember: they’re six feet tall and very possibly anorexic. You might look good in those clothes, too – if you’re anorexic. But, oh dearie me, I hope you’re not. Furthermore, all they have to do is stand still and strike an alluring pose for the photographer. You have to do stuff whilst wearing your clothes. You know – sit, stoop, kneel, stretch, etc. The styles they’re modeling may, but more likely may not, have been designed with the working woman in mind. They may look cute, but nowhere close to professional. Looking unprofessional in the corporate world can be a deal-breaker, come promotion time, as you already know. Shucks, you may not even get in if you look unprofessional, since most people – including the higher-ups where you work or would like to work – judge a book by the cover. If your “cover” looks unprofessional, they’ll stop right there. During new-clothes-buying forays, bend over facing the mirror. Bend over with your rear to the mirror. Kneel. Pretend you’re reaching across a conference table. Stretch high for some pretend files. Stretch low to pick up pretend dropped files. Sit with your back to the mirror. Your dressing room gymnastics will soon show certain fashion fads parade way more of your bare backside than you can reasonably assume coworkers care to see. It will become painfully evident when a neckline is just too distractingly low for professional attire. Too-tight garments will be so uncomfortable that when you bend, kneel, and stretch, you’ll fidget like a three-year-old in toilet training. Fashion fads that are just TOO much will become obviously so – once you’re paying attention. Clothes-buying decisions will grow easier and quicker to make – once you’re paying attention. And when you stop the thoughtless practice of adding fight-with-me clothes to your wardrobe and become accustomed to what all your guy peers already know, you may find you have even less patience with fight-with-me fashion fads. But what to do with all those clothes that have become closet dregs? Get a good-riddance thrill by dropping them off at your local thrift store. Wait. Isn’t that hypocritical? Aren’t you just passing on bad juju to some other, unsuspecting female? Maybe – depends on her weight, size, and profession. But if your closet rejects are as bad as you think, they won’t sell – as clothing. You can continue to fight with your clothes all in the name of style, or you can show up looking and acting like a well-dressed professional – the knows-what-she’s-doing kind of pro that you are. As you can tell, my money’s on the latter. And so is your boss’s, by the way. How do I know? My “bosses” (clients) starting giving me a whole lot more respect and undivided attention once I stopped fidgeting and fighting with my clothes. Pay attention to yourself in your next meeting, even if it’s just with your manager and no one else. Pay attention to every time you adjust an article of clothing (or your hair). Pay attention to your hands in your next departmental/committee meeting. Are you busy contributing and taking notes, or are you busy fighting with your clothes? Oh maaaan. Numbers – lots and lots of ’em. A whole section of my brain turns to mush when I see a paragraph full of numbers – or worse, the evil spreadsheet. I’ve been this way ever since those terrifying math flash cards in second grade. Those niggling word problems in third grade were even more terrifying. “Jack is traveling west going 35 mph while Tom is traveling east going 45 mph. When will they meet, and will they collide?” I always wondered why we couldn’t just let Jack and Tom work out their own problems and stop harassing millions of third-graders with them. According to my husband, my brain has an inordinate number of little mice running furiously ’round and ’round in tiny little mice cages generating way too much neural electricity. Oddly enough, all that neural activity comes to an abrupt full stop when I read a paragraph full of numbers. First, panic sets in. Then the mush part of my brain says, It’s gibberish; just skip it. So I do. Of course, that means I miss some rather pertinent details – dates, dollar amounts, addresses. You know – stuff I probably need to know. Don’t care. Small price to pay for not having a large part of my brain turn to mush, I say. This deficiency isn’t much of an irritant – until I think back on my youth. My father had the mistaken idea that since I was college-bound, I needed as much high school math as possible. I waded through Alegebra I and II, Plane Geometry, and Trigonometry. You can imagine the teeth-grinding that occurred when I discovered college English majors could wing it with a simple Basic Math course and be done with the whole numbers gig. WHAT a waste: eight – count ’em, EIGHT – semesters of my youth spent in anxious, nervous panic for no good reason. The only take-away I routinely use from a misspent year in Geometry I is the concept that the shortest distance between two points is a straight line. I mean, really! An idiot could work out that fact without ever spending one hour in geometry class. And the rest of my torture? I can’t say that I’ve had to deal much with isosceles triangles, or at least not that I’ve been aware of. So you see, all that angst Mr. Neece inflicted on me was pointless. Ordinary Americans like me shouldn’t even have geometry on their radar screens. And don’t get me started on algebra and trigonometry. I have one alegebraic formula that I’ve used in sewing projects. ONE – over a fifty year span. Really? We need this brain-drain stuff? I have some pay-attention points. We all have deficiencies. Sometimes we can make them less so with a lot of education (my eight semesters) and neural energy (my bazillion hours spent on math homework). Sometimes not. Sometimes, it’s just way simpler and smarter to find a reliable workaround. In other words, get over our deficiency, and get on with what we do well. If you’re my opposite and you love numbers, then you may be stymied when it’s time to write a sensitive note of condolence. Your deficiency is using words capably: mine is numbers. We’d both rather be eaten by angry army ants than function in our deficient areas. Guilt your spouse into writing all the condolence notes and every other bit of communication? That’s an option, but it’s kinda cheesy. How about searching for a sympathy card that sounds like something you’d actually say – and stockpiling 20? Make that 40. Sign your name. Bingo bango: a workaround that works. What if you’re a whip-smart computer geek, but your brain is easily foiled by garden-variety household chores? Your workaround might be investing in a Household Maintenance for Dummies book. Or maybe “fix dummy-self” isn’t on your to-do list any more than “fix kitchen faucet” is on it. So what about exchanging an hour of PC-and-peripherals tune-up for kitchen faucet repair with your handy, tool-guy friend? pay-attention tips for the day. We ALL have deficiencies, and we usually know what they are. 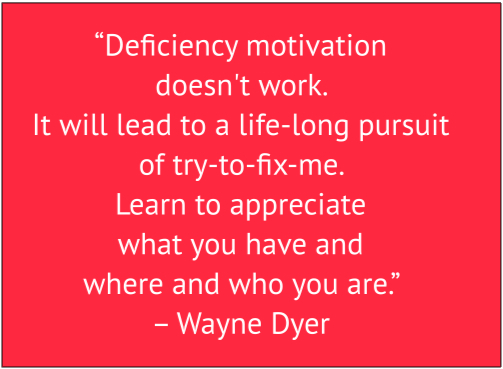 Find yourself a workaround or go-to person to help you with your deficiency. Then get over it. We can’t all be good at everything, now can we? Of course, as you numbers people know, there are times when a non-numbers person needs to deal with numbers. So I’ll just bet you’re dying to know my workaround. Simple. I know how to use a calculator – sort of. After all, it has numbers and squiggly math symbols all over it, and I’ve already told you how they affect me. When I’m really befuddled, though, I go to my husband who’s marginally better at math and whose brain doesn’t turn to mush when he sees a string of digits. So, ever since I married and cheap calculators became ubiquitous (a few years later), I’ve had it made. Count ’em. That’s two workarounds, so I’m set. How about you? What’s your foremost deficiency? Don’t berate yourself for it; find a workaround. Get on with your life, and – if you think about it – share your splendid workaround with the rest of us, who just may have the same deficiency and be in dire need of your workaround. When’s the last time someone lied to you? Five minutes ago? Yesterday? Two whole days ago? Chances are, it wasn’t very long ago. In fact, it appears to me that as a society, we’re getting pretty used to being lied to. I find that unacceptable. How about you? Are you like me in that deep down inside, Honesty (and its sidekick, Integrity) are right up there at the top of your must-have list? Do you expect your business associates, family members, friends – virtually anyone with whom you have more than a cursory relationship – to be honest? Do others call you “extreme,” “too tightly laced”? In this rare instance, I’m saying pay no attention. Stick to your principles! Why? Because, as you well know, those who lie to you don’t lie once in a great while. They don’t lie only when they’re in a real fix. They don’t lie only when the stakes are high, and they have a lot to gain – or lose. No, lying is a habit for liars. I’ve learned, THE HARD WAY, that people who lie are people who lie. They may be telling the truth to you today or this minute. Or not. I’ll bet you also know that this maybe-maybe-not is the crux of the problem. You never know where you stand with liars. Associating with a liar means you must always privately question whatever she says. And who wants to sign on for the job of continually checking the veracity of statements made by a friend, employee, co-worker, spouse? I sure don’t. Like you, I have enough things on my to-do list for each day; I don’t need to add, “verify Carla’s every statement” to the list. Honesty alert: These aren’t my own astute observations. I filched them from a retired FBI agent friend who’s a polygraph expert. Liars don’t answer the question you asked. They answer, just not with an answer to the question you asked. Here’s an example. Question: “Were you in the 7-Eleven on Main Street last night at 1 a.m.?” Answer: “I didn’t need anything from the 7-Eleven.” It’s an answer, is it not? Yes, but it doesn’t answer the question posed. Liars tell part of the truth but not all of it. Those in the know call it “editing.” The story they tell is truthful, but they carefully edit out the incriminating bits. Using the same example, let’s see how this would look. Question, “Did you rob the 7-Eleven on Main Street last night?” Answer: “You know, I think I did go to that 7-Eleven to get a bag of chips.” Now, what he isn’t telling is that after he picked up the bag of chips, he kindly asked the clerk for all the money in the till. Did he get a bag of chips? Yep. But the chip bit is only part of the truth. So what’s my point? If you find yourself dealing with someone whom you catch telling you an untruth from time to time, know this: you’re catching about one in ten of his lies because he’s polished the above two tricks to perfection. What to do? But most of us don’t run away. Even when we know someone close to us is routinely lying, we still hang around and, worse, still believe them. Now why is that? 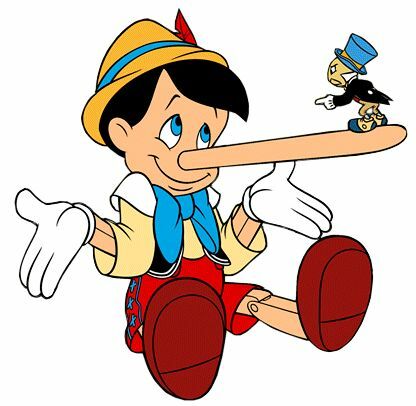 My retired FBI friend says there are two reasons we keep hanging with liars and keep allowing them to be successful as liars. We believe what we want to believe. It’s just too uncomfortable to believe those close to us would lie. It’s far easier to accept a lie than deal with its ramifications. Are you the one who occasionally tells a little fib? Then you have a bigger problem than you know; you can’t run away because the problem is you. You’ve developed a habit of lying. Like all habits, you engage in it without even thinking. If you intend to hang with people you can trust, you have to be trustworthy. And trust me, the people you hang with now aren’t. They’re just like you. They tell the truth very poorly and only when it suits them. In this case, you – and only you – as the leopard, can change your spots. Much as others might like to, they can’t change us. Only we can change us. Only I can change me. Only you can change you. I told you I learned this lesson about liars the hard way. I allowed a person very close to me to lie to me for a very, very long time. Why? I was being deliberately naïve and didn’t want to believe he would lie to me. I wanted to give him a second chance because it was easier than confrontation and dealing with the issue. I finally stopped at the 300th second chance, more’s the pity. I was duped in more ways than you can possibly imagine, and I’m assuming you have an abundantly active imagination. The most challenging lessons to learn are the ones we don’t want to learn, and I didn’t want to learn that this person would lie to me. I also didn’t want to learn that what I knew about him would apply to so many other people. Liars lie to people. Period. End of story. Nothing more to tell. But maybe “nothing more to tell” doesn’t quite cut it for you. You’d like to know why people lie. I suppose there are as many reasons as there are people. Plenty of websites deal with this; check them out, if you like. I’ve decided it really doesn’t matter. Even if I know why people lie to me, they’ll still be lying to me; and that’s the part I find completely and totally unacceptable. If, however, you’re the person doing the lying and you realize you’re sabotaging your own life, you definitely need to get answers to the why question. A visit to a professional counselor might be in order, and – good news – the answers might be easier to ferret out than you think. I once worked with a woman who was a pathological liar, if ever there was one. One day she told me a story about how things worked in her family when she was growing up which helped me understand why she lied. She had no idea she was lying right and left. Everyone else in the office did, though; her continual lying eventually got her fired. But the point here is that events in her childhood encouraged her to develop the habit of lying and as a thirty-something adult, lying was second nature for her. How about you? What’s causing you to bend the truth? Find out, and find out fast. Even in today’s world of incredibly lax moral standards, liars don’t usually get too far. They get found out and fired. They get taken to court, convicted, and sent to the clink. They get discovered, slapped, and told by someone very dear to them that that someone never wants to see them again. A liar’s life is grim, perilous, and empty. When you catch a person lying to you, be assured it isn’t a new phenomenon. Run like the wind! If you’re the person who tells stories, find out why. Then retrain yourself to tell the truth, the whole truth, and nothing but the truth. Retraining can be done, and you’re the only person who can do it. Personal confession: even though I know all this, I still find myself believing liars and all the while, beating myself up for not following my own advice! So how about sharing some of your methods for dealing with liars to help me stop this ridiculous practice of letting liars have their way with me?